The driest autumn in the history of Switzerland has delayed the opening up of country's ski season this year as there is shortage of snow across the Alps. 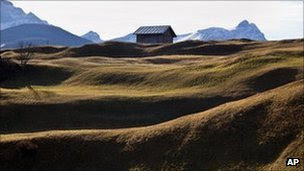 BBC correspondents say the continuing drought is bad news for the country's tourism industry which is already suffering from the strong Swiss franc. However to some delight of the skiers, big resorts such as Davos or St Moritz have been able to open a few runs with the help of snow cannons.